Chili’s come in a variety of sizes and shapes as well as a variance in hotness. They are a fantastic source of Vitamins A and C as well as folic acid and carotenoids. Some people like it hot, some not. If you are amongst those that like a ‘kick’ to your food, then you are one of the lucky ones. 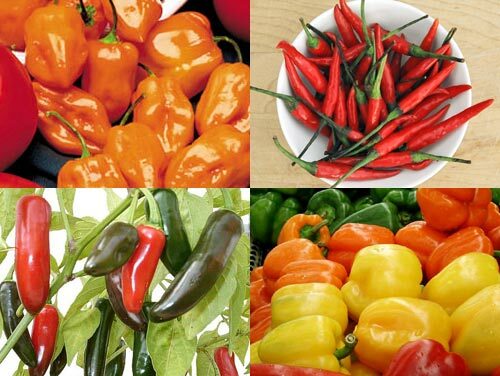 Chili peppers, unlike sweet peppers, contain a substance called Capsaicin which gives the chili their hotness. Capsaicin is not only ‘hot’ in your mouth but hot to the touch. When cutting up a chili, especially one of the hotter versions like Scotch Bonnet, Habanero, or Chile de Arbol, make sure to wash your hands before touching your face, especially your eyes! So what is so great about that Capsaicin? It is a fantastic substance! History and folk medicine used chili peppers for asthma, fevers, sore throats, and other respiratory tract infections, digestive disturbances, and cancers. Although seemingly hot, it actually has a cooling effect by lowering body temperature. It simulates the cooling center of the hypothalamus in the brain. This is why it is often common to find hot climates eating foods laden with chili peppers. It has beneficial effects on the cardiovascular system. It reduces the likelihood of developing atherosclerosis by reducing blood cholesterol and triglycerides. Cultures that consume chili peppers on a regular basis have healthy cardiovascular systems along with many other health benefits. Maybe it is time to add more chili peppers into your daily diet.